I have been going a little gung-ho with the local farmers’ market recently. My seasonal clock has not quite adjusted to the California growing season, and I just cannot get over that I can still buy local produce this late into November. I’m used to buying brussel sprouts and perhaps a few lingering heads of cauliflower this time of year in New York, not the variety of fruits and vegetables that are still adorning the farmers’ markets in the Pasadena area. I have scouted out many of the farmers’ markets in and around Pasadena and discovered these beautiful organic baby eggplants at the Old L.A. Farmer’s Market in Highland Park. Highland Park, which is just minutes down the 110 Freeway from Pasadena, is one of the oldest settled areas in Los Angeles. Nestled right next to the Arroyo Seco, Highland Park seems to be a culturally diverse, hipster kind of community, and reminded me a little of Astoria Queens, without the el train. Feeling right at home in my Queens away from Queens, I couldn’t resist buying these baby eggplants despite the fact that I generally steer clear of them unless prepared by someone else. I find eggplant to be a lot of work and I lack the patience to properly salt and soak them to remove some of the vegetable’s natural bitterness. However, these baby eggplants were so purple, so fresh and so delicious looking, and averaging about an inch and a half to two inches tall and roughly an inch wide, I anticipated them being tender and sweet and not as bitter as the larger eggplant we commonly see in the market. Unfortunately, I was wrong. My plan was to slice these baby eggplants width-wise, season them with salt, pepper and paprika and sauté them in a little olive oil. This is my go-to preparation with many vegetables, especially yellow squash and zucchini. I really love sautéed vegetables and seasoning them with paprika really adds a nice flavor when blended with the olive oil. So I got to work on sautéing my eggplant, foregoing the laborious salting process. Big mistake. Due to my eggplant naiveté, I did not realize that salting eggplant not only tenderizes the eggplant meat, but pulls out some of its water content making it less permeable to absorbing oil used when cooking. A few minutes into sautéing my eggplant, I found that I had to add more olive oil because the eggplant had absorbed all of what was in the pan, and despite using a non-stick skillet, my eggplant turned crispy and stuck to the pan’s surface. Although my eggplant did not cook into tender slices of perfectly seasoned eggplant, I did learn two important culinary lessons. 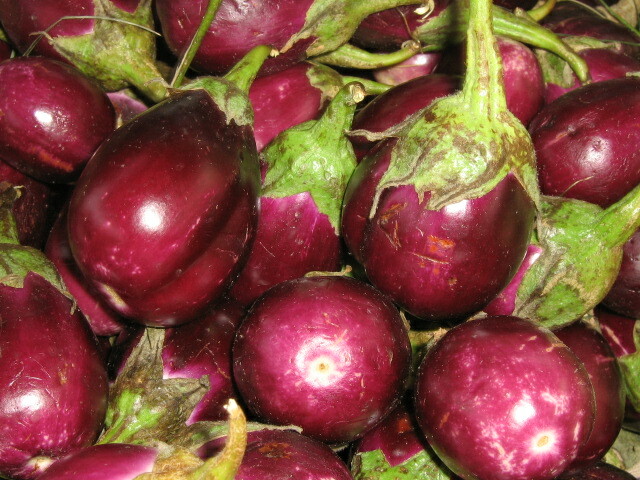 First, eggplant, no matter its size should not be subjected to culinary short-cuts. And second, I may have inadvertently invented something new – eggplant chips! Perhaps my culinary disaster could turn into a snack-food revolution?! This entry was posted on November 18, 2008 at 11:26 pm and is filed under California Produce, Recipe Ideas. You can follow any responses to this entry through the RSS 2.0 feed. You can leave a response, or trackback from your own site. Someone brought me two baby eggplants as garnish but thoughtI’d try to prepare them! Found your article, adorable— I’ll give it a shot!!! Definitely will salt them first! ANd soak in water?